Richard [the name he was always known by] Becker was born at Neukirch in the Barossa Valley of South Australia on 22nd June 1870, the fourth of seven children of Auguste and Gustav Becker. In 1872 his father bought section 75 of newly opened virgin land in the Appila district in the mid north of South Australia. I assume the family moved north soon after this land purchase when Richard was still a little child. In 1775 a Lutheran School had been built on Joppich land in the Appila District and it would serve as the Lutheran School for the Lutherans in the District for almost 100 years. It is likely that Richard received some of his education in this school. It is likely that Richard also attended school on a property [section 17 Appila] his father had purchased and where a building was used briefly, maybe only for several years as a school. There are no School records. Part of this section of land was bought by a Lutheran Congregation [Later part of the E L C A Lutheran Synod]. The family was linked to several different Lutheran Synods at different times. Richard’s father died in 1899 when Richard was 29 years old, followed by his mother three years later. Their gravestones stand in the Pine Creek Lutheran Cemetery, shared by Lutherans of different Synods. 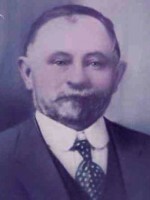 The Land Titles to the Becker Appila District Properties, sections 16, 17 and 75, were taken over by Gotthelf Benjamin RICHARD BECKER on 31st January 1903, when he was 33 years old. At some point the Becker family had joined the Pine Creek Lutheran Church of Pastor Ortenburger [later U E L C A Synod]. In family letters Richard and his siblings report on the building of the new Pine Creek Church, opened in 1901. They could see the construction of the new Church from their home farm. On 3rd October 1906 Richard married Emma Cecilia Zänker in the Pine Creek Lutheran Church near Appila. Emma was 21 years old and Richard 35. 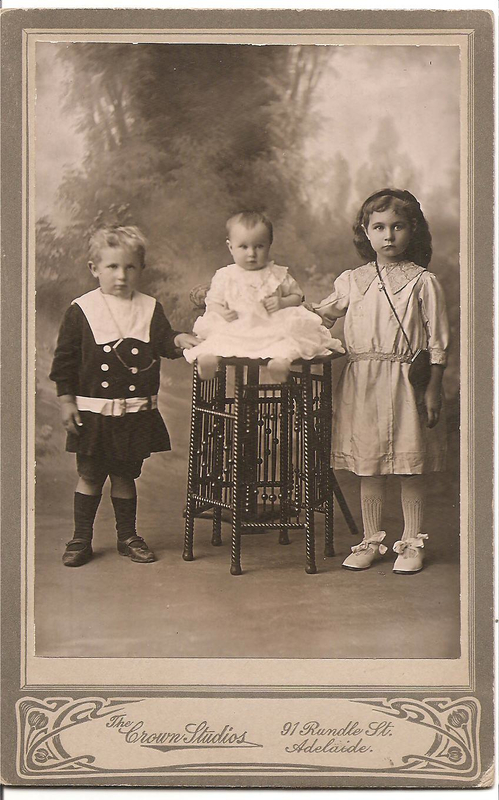 In 1907 their first child Rita arrived. She was their only child to be born on this property. Richard bought the property from his brother. This property became known as “The Willows” and is the central Becker Property in this Becker website. Five more children were born to Emma and Richard at the Willows: Eric in 1910, Frieda in 1913, Melvin in 1916, Linda in 1921, Lorna in 1926 and Rex in 1928. Richard planned to turn an acre of the farm into an orchard. It would be irrigated with the plentiful stream of the Pine Creek fresh water flowing through the property and past “The Willows” homestead. On one side of the road that led into the farm from the main road, and nearly up to the homestead, he installed a windmill, and planted vines and a wide variety of fruit trees, and dug channels for the water to feed the orchard. Approximately ten acres that included the orchard and acres of lucerne were leveled for irrigation. The lucerne was prime stock feed for the horses and cows. At some point the Pine Creek water became salty. There are several theories on the cause. One is that an earthquake had released a lot of salt that washed into the small creek that became known as “Salt Water Creek”, and flowed into the Pine Creek on Weston’s property about three k’s north of “The Willows”. [This small creek began in what was originally Prior’s farm, then flowed through Peter [and later Ed] Zwar’s farm before entering the Pine Creek on Weston’s [later Ralph Zanker’s] farm. Another possibility was suggested to me by Malcolm Ives, a friend of mine who has a Doctorate in Horticulture. I described the situation to Malcolm. He suggested that the natural soil running along the sides of the creek had “perennial, deep rooted vegetation, including shrubs and trees. It had deep, absorptive soil, that kept the salt in check. When the soil was cleared for farming, ploughed up and maybe overgrazed, the soil profile on low flat land became shallow and concrete-like on the surface. Evaporation now led to surface salt residue from salt water raised by capillary action. This led to increased salt water runoff in rainfalls. I think this could also have happened along many sections of the Pine Creek upstream of The Willows farm on the Appila plains. Wherever the salt came from, it eventually ruined the irrigation project at “The Willows”. The family still enjoyed peaches, apricots and grapes at home, but not on a commercial scale. On the other side of the driveway into the Becker farm Richard built an open drain and a culvert to take rainwater runoff from the main road, to flow under the driveway and water the orchard. Further along this northern side of the driveway there were many large gum trees, and at the house end stood the barn and the sheep yards. The barn had a wooden floor. It was used to store grain used as stock feed, and seed grain for the following year, as well as bagged fertilizer. Rex Becker said the only social event he could remember held in the barn was for a 21st Birthday, possibly for his brother Melvin. 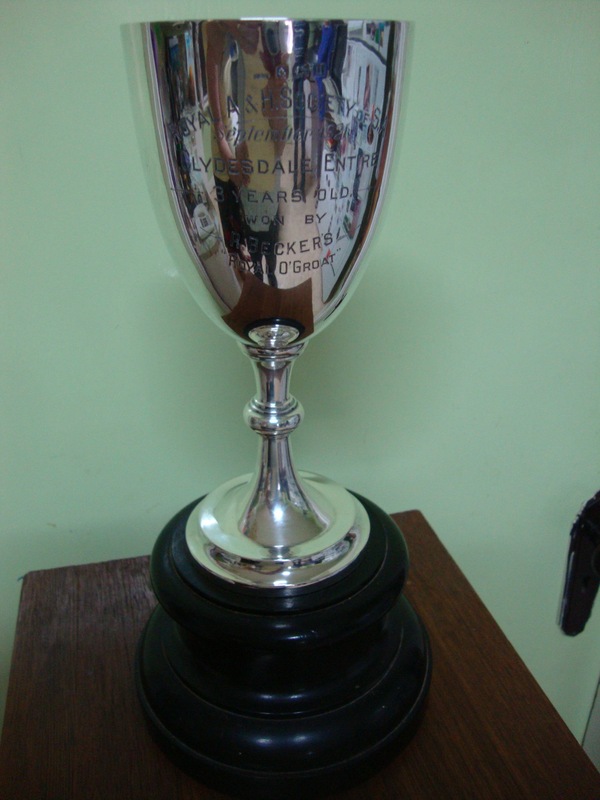 “and a government proclaimed stock route called the ‘Laura-Hammond Stock Route’. (… Rex Becker). It was used by sheep drovers to drive their flocks of sheep through this area in the early days. Near the farm gate, on the Laura side, there was a small paddock fenced off so the drovers could leave their sheep in the paddock overnight. The large barn by the sheep yards had a small room in it. The drovers would sleep in this small room in the barn. “Richard always welcomed drovers to ‘overnight’ their stock here. Richard would spend half the night yarning with drovers.” (Rex Becker). The sheep yards included a swim through sheep dip. Farmers in the district would bring their blocks of sheep to be dipped. 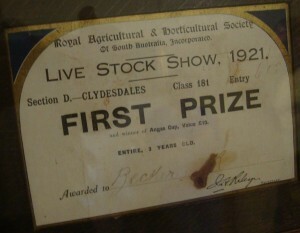 Richard enjoyed entering competitions in the Shows with poultry and other live stock. 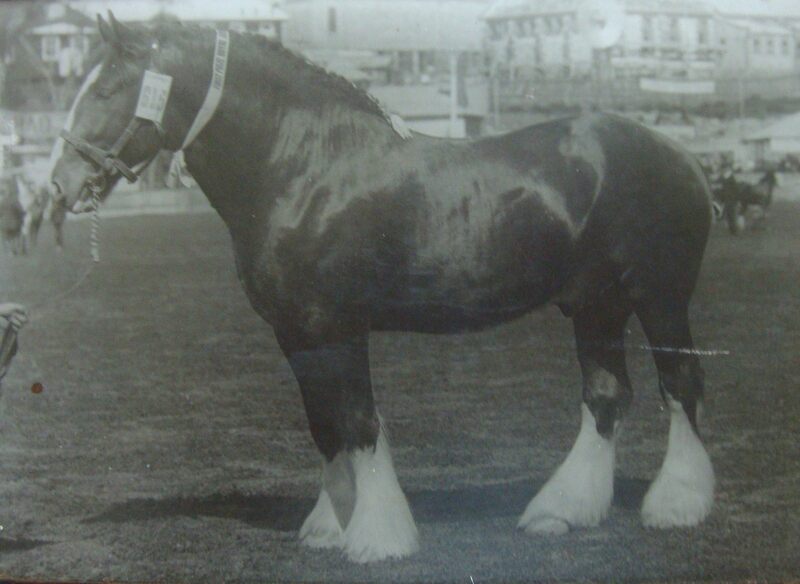 His greatest win came in the Adelaide show in 1921 with his Clydesdale “Royal O’Groat”. “ROYAL A & H SOCIETY of S.A.
Once Richard mentioned in passing to a drover that his wife Emma was fascinated by kookaburras. Some months later the drover came by and handed Richard a pair of young kookaburras – still furry and not long out of their nest. The kookaburras became family pets. Melvin remembered that they ate lots of meat! A tub was kept under the tap of a rainwater tank and they kept the tub full of water for the kookaburras who loved to bathe in it. One day the tub was half empty. The kookaburras went in for their bath and the water weighed them down and they drowned as they couldn’t get out of the tub. On the bank of the Pine Creek and nearer the house Richard built a well, driven by a belt from a shaft at the top. Buried pipes took the water past the barn and into the fruit and vegetable gardens. The big flood in 1941 led to many changes. It washed the well, the barn and sheep yards away. Today there is still a mound covered with grass where the barn had stood. 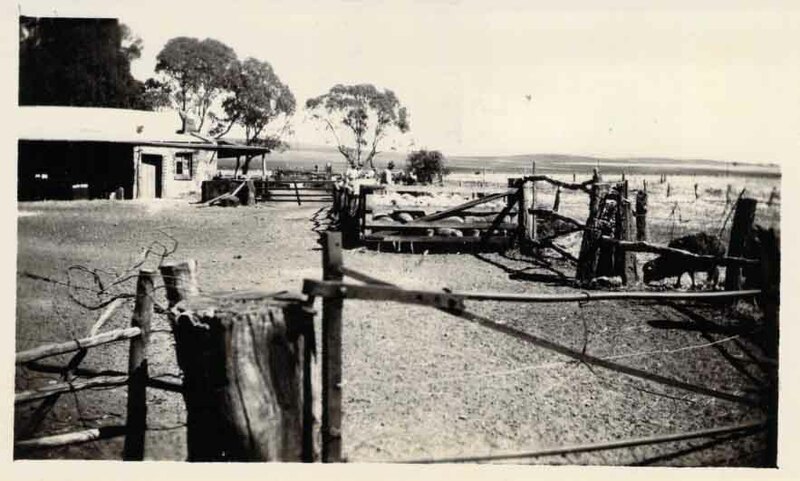 New sheep yards and a shearing shed were built on the southern side of the house and farm buildings, near the round brick water tank and next to the a new dairy and cow yard. Richard had died five years before the Big Flood. His son Rex said his father regarded German as God’s only language. He spoke English with an accent and loved to chat with his neighbor (Higgins) and the sheep drovers and other local farmers. The Beckers showed horses in the Country shows. 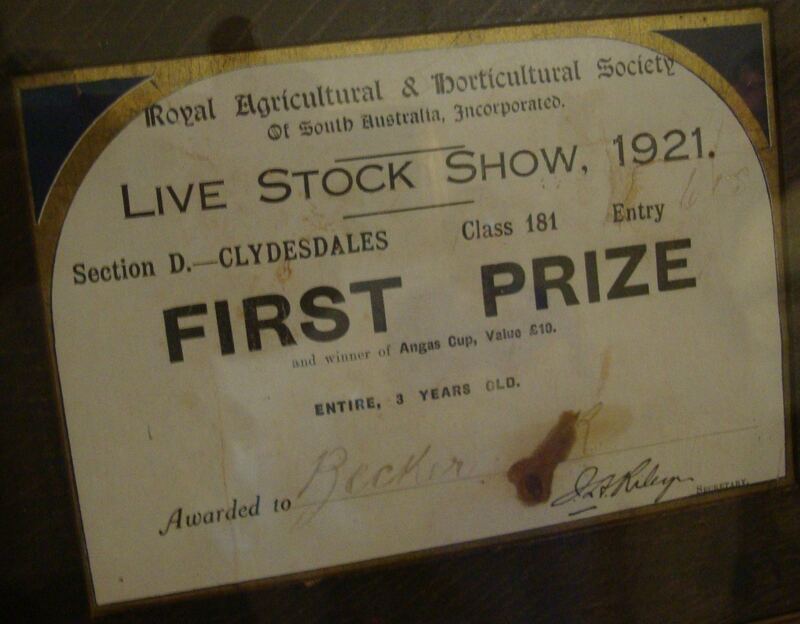 Their greatest thrill was the year their Clydesdale won the cup in the Adelaide show. Rex was only six years old when his father died. All of his memories of his father are of him as a sick man. He remembers the doctor calling regularly to drain the fluids from his body, due to his Dropsy / Edema.